Nazrun Chowdhury can’t believe that the Charles Hayden Foundation was willing to spend its money sponsoring “a kid from the Bronx.” The foundation provides grants that focus on helping youth develop the skills and knowledge needed to succeed in school and lay the foundation for satisfying and productive lives. This year, the foundation sponsored 20 Syracuse University Summer College students. 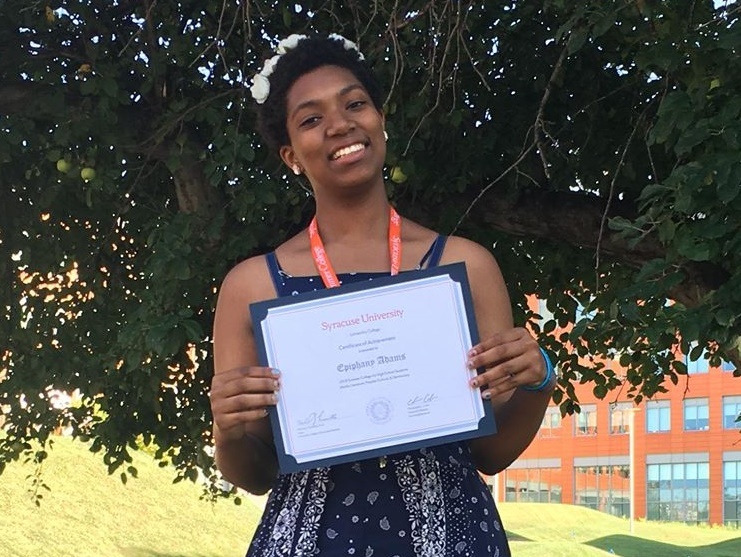 Epiphany Adams, a senior at Frederick Douglass Academy in New York City, holds a certificate of completion from the Summer College program at Syracuse University. This year, 501 students from 35 U.S. states, Puerto Rico and the Virgin Islands—as well as 70 students representing 19 foreign countries—attended Summer College. Epiphany Adams, a senior at Frederick Douglass Academy in New York City, agrees that the Summer College experience was more difficult than expected. She thought that taking Advanced Placement courses in high school prepared her for the coursework and academic requirements of college but soon learned that she was not as prepared as she hoped. Adams was also concerned she wouldn’t fit in, but found that attending the program helped her become a more social person. “I was immediately accepted for who I was. I wasn’t afraid to be myself,” she adds. After experiencing Summer College, Adams and Chowdhury returned home with an arsenal of tools to succeed in college—time management, discipline and discovering that they could be comfortable in a global culture. “I’m so thankful for a program that helped me grow personally and academically,” says Adams. “If I could, I would rewind time and do it all over again.